Welcome to W/2 Rentals. 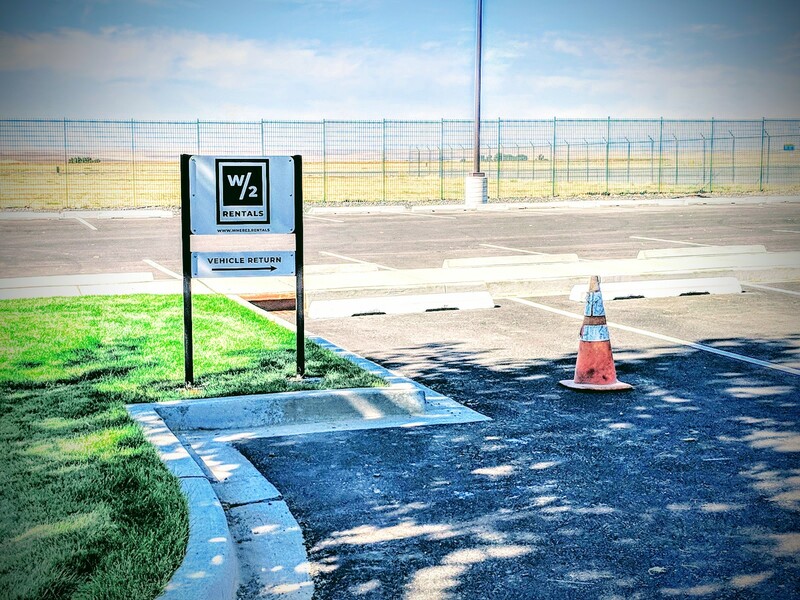 We are a local, independent passenger vehicle rental company located in the Walla Walla Valley. Use our online booking system or call us to make a reservation. We’ve outlined the steps below. What if I just need a quote? Follow Booking Steps 1-3 below and click on the "Quote" button towards the bottom of the screen, enter your email address and there you have it. You can also continue to register a user account and request a quote at Step 5. The Step 3 and Step 5 quote requests will include a link to return to the booking process. You can make changes, or continue the booking and get a confirmed reservation upon full payment. Below is a step by step guide on how our booking process works. How do I to start the reservation process? Start by clicking the red button on the Home Page or the link in the website footer. From there, follow the six steps in our booking process: first is to select the dates you’re interested in, the last is pay & confirm. Enter your email address (optional at this step; if added, it will be associated with your Renter and Driver information in Step 4). Select Pickup and Return date and time for your booking. Note: one day is on a 24-hour clock, this means that if you select rental start at 10 AM, the rental end time is 24 hours later at 10 AM. All reservations must be made 24-hours in advance of Pickup date. Then select the Pickup and Return location. Note: Walla Walla Regional Airport is the default. If you choose to customize your Pickup and Return location there’s a small fee. You will confirm this custom selection in Step 3, Options. Step 2: Vehicle Available vehicles, features, add-on’s with rates for your selected rental period. After reviewing, select your vehicle by clicking on the box below the daily rate(s) and total for the vehicle you have chosen for your rental time period. Step 3: Options Options step you will see equipment and services. Please note our Mercedes Sprinter Vans are Diesel Fuel ONLY. We do not require you to fill the tank when returning the vehicle. We will not charge you for fuel used with your rental. If you require more than a tank of fuel however, it is on you. If there are going to be additional drivers, make that selection here. We will allow for custom Pickup and Return locations and you can add vehicle upgrades, like Wi-fi, cooler or refrigerator if available here. Finish selecting your Options and continue on to Step 4, Renter and Driver information. Once your order has been updated select the button either below the rental summary or at the bottom of the page to continue on to Step 4 Renter and Driver information. Step 4: Renter and Driver information Returning Customer login with with Google or the email address (Social Login) used with your account set-up from a previous rental. If not a returning customer, Create New Account. General section, complete all fields. You are the Customer. The Customer is also the Renter and in most cases also the Primary Driver. The only times when the Customer may not be the Primary Driver is where we have a commercial relationship and the Primary Driver is a named employee of the business. You must be 25 years old too use a W/2 Rentals vehicle. The birth-date information will be cross-checked with the drivers license submitted in the next section. Renter Drivers License section, complete all fields. Enter drivers license #, expiration date and upload a color photo or scan of the actual drivers license. In the Renters Insurance Policy information, you will need to enter the; insurance policy #, expiration date as well as upload either a scan or photo of the actual insurance card or policy. If you have completed all fields in these Sections, click on on the bottom left of the page to continue to Step 5 Booking Request. If you selected Additional Drivers in Step 3, start by clicking on Extra Driver Information (#1). Enter the extra drivers license #, expiration date and then upload photo of the extra drivers license. Then have the extra driver sign the signature line. Repeat the above process for each extra driver’s information. When finished, click on on the bottom left of the page to continue to Step 5 Booking Request. Step 5: Booking Request All of the information provided in steps 1-4 are shown here on your Booking Request: Vehicle Selection, General Information, DL, Insurance, Uploads, Booking Dates, Summary of all, Options, Cost, etc. In order to ensure an efficient and accurate booking and reservation process, PLEASE enter all of the information requested. All information will be verified. Missing or incomplete information (for example, a photo upload that is not correct) will require follow-up before reservation is complete. If all of your information looks correct, confirm your reservation by signing, check the checkbox then select the button. If you’d like to make changes to any your information here at the Booking Request step, e.g. booking dates, options etc., use the back arrow on your browser to click back to the step you’d like to change. Once changes are made, select button (or button if on Step 2, Vehicle Selection). 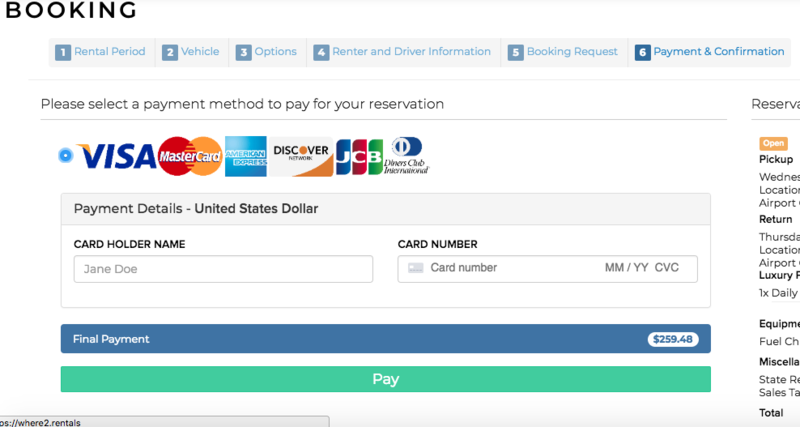 After verifying your information is correct, return to Step 5, Booking Request to secure your reservation by signing, selecting the checkbox then clicking the and proceed to Step 6, Payment & Confirmation. Step 6: Payment & Confirmation You will see Radio button selection next to all accepted payment methods. Please select this radio button. (As you will see, we only accept major credit cards at this time. Please see the FAQ about using credit cards for additional information.) Once selected enter your name and credit card information, final payment required to secure your reservation will auto-populate. Then click on the green button marked Pay. You will receive a confirmation email from W/2 Rentals with all of your reservation information and the rental agreement. Cancellations Please note that if you need to cancel your confirmed Van rental be aware of the cancellation policies as explained in our FAQ’s or in the rental agreement you received in your confirmation email. On your reservation day we’ll meet you with keys, check that it is you and help you on your way! More information, check the Pick-up and Drop-off information in Renting with Us – How it Works. Have any problems or issues? Love our service, or just want to drop us a note? We can be contacted at rentals@where2.rentals or by calling (509) 301-9140 or (509) 301-9658 with any questions or comments.